In a new picture book called Medieval Monsters, published by the British Library, historian Damien Kempf and art historian Maria L. Gilbert have gathered together illustrations that highlight the great monsters of the medieval world. Monsters were everywhere, including "on the edges of manuscript pages" and on "the fringes of maps." The successor to Medieval Cats and Medieval Dogs, Medieval Monsters contains no shortage of fascinating illustrations, including the one above. It looks remarkably like Yoda, doesn't it? 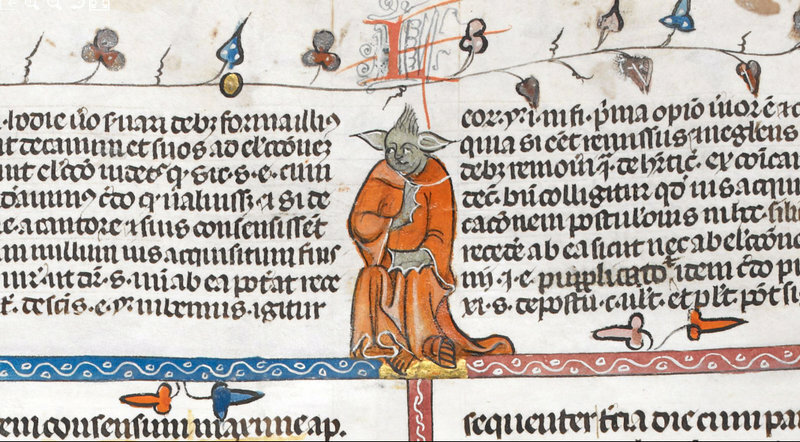 A British Library curator told NPR, "The Yoda image comes from a 14th-century manuscript known as the Smithfield Decretals." "I'd love to say that it really was Yoda, or was drawn by a medieval time traveler." But "it's actually an illustration to the biblical story of Samson — the artist clearly had a vivid imagination!" See more monsters at the British Library's Medieval Manuscripts blog. It doesn’t look like Yoda that much – but I appreciate the artist’s sense of humor in drawing some male genitalia to the right of the figure.